After six years in the BT Premiership is it time for the Greens to wave goodbye to the top division of Scottish rugby? Can Nikki Walker sign off as head coach of his boyhood club with one of the biggest wins of his career? Or will the pressure and expectation be too much? All will be decided Saturday. 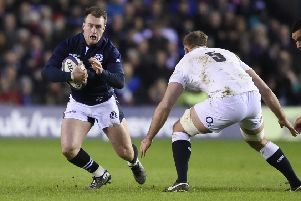 Hawick’s relegation purgatory is finally nearing its conclusion and there are two distinct camps assessing the Robbie Dyes predicament in vastly different ways, agreeing only that it is, indeed a predicament. One group believes the chance of a National league One side taking down Hawick is minimal, indicating that the Greens’ Premiership pedigree will overcome anything Edinburgh Accies will throw at them. The other camp says, “I hope, but I just don’t know”. There is merit and validity in both. But all Greens supporters need to get this straight: this game is finely balanced. Edinburgh Accies are a young side full of confidence to go with their obvious skill and match-up well against a Hawick group who play a similar brand of fast-paced, attacking rugby but have struggled mightily to show much of it this season. “They are the form side, not us, there’s no doubt about it,” said Hawick captain Bruce McNeil this week. How, then, to predict the unpredictable? On Saturday, Greens supporters in either camp head to the outskirts of the Borders to Lasswade expecting, knowing, hoping and praying for some kind of performance. Any kind of performance. That delivers them from this relegation doubt. “We understand the level of pressure everyone is under right now but I think myself and Scott [MacLeod] have done a good job of guiding the players through this difficult period,” said head coach Walker. “Pressure is something that is difficult to control, some deal with it well and others not so much. We have worked on making sure everyone understands their roles and that all they need to do is stick to them. Thinking too much about the town/s expectations or being relegated is not something that is going to help. “After a long seven/eight weeks there were times I thought we might struggle to get a team out there because we had so many injuries, but we have slowly pieced ourselves back together – and if I am honest, it should be one of the strongest teams we’ll have out there in a long time. Whichever way Saturday ends, it will be Walker’s last ride as head coach of Hawick RFC. In his three years at the helm he has a record of 39 wins, 33 losses and two draws, leading the club to a Border League title, final of the BT Cup (both 2014) and as high as fifth in the premiership and while he is not one for pondering his legacy at Mansfield Park, Walker does not want to leave his hometown club with a relegation stain. “It has been great being the coach of Hawick, my hometown side, and while I am not one for thinking too much about what I have achieved, the last thing I want to do is get my hometown club relegated,” continued Walker. “No one wants that on their CV. Myself and Scott have worked hard to get us to where we are. It hasn’t been easy this season.